Save energy on your lighting! 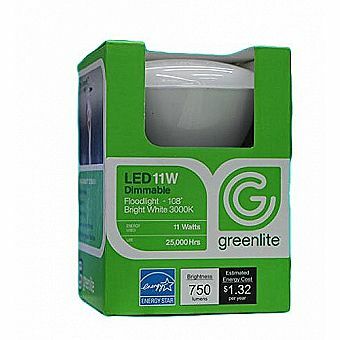 Greenlite's Dimmable LED 11W BR30 is a direct replacement for indoor reflector bulbs and is ideal to illuminate residential and commercial areas where incandescent and halogen reflectors are typically used in recessed or track lighting. This energy-efficient dimmable product is instant-on, fully dimmable, has a bright white 3000°K color temperature, and a longer than industry standard average rated life of 25, 000 hours - not to mention that it saves up to 75% in energy costs! ENERGY STAR® certified. Energy Star Model # 11W/LED/BR30/D Lumens: 750 Hours: 25000 Replaces: 65W M.O.L. : 5.17" Volt: 120 V Base: E26 Kelvin: 3000 K Remember that to use the dimming feature you need to install an LED compatible dimmer switch otherwise you'll find that these will flicker on a standard dimmer and you'll risk burning them out more quickly.